I was “lucky” enough to be there before the plows to witness first hand the blissful blessing of the new fallen snow. It was Christmas card perfect. Pristine and sparkly, with the look of a soft blanket, it almost took me back to those fuzzy days of yore, but then I noticed the snow plow heading straight for me. I pulled over to the side of the road and stopped. I didn’t want to risk sliding off the shoulder and into whatever was beyond the shoulder. Better to have the experienced snow plow driver navigate around a stationary car. By the time I picked up my appointment and headed further south for our lunch meeting at Ilio’s, the sun was shining, all the roads were plowed, and the snow looked even more impressive. Until we got to Lackawanna. There was hardly any snow there. Unlike Blasdell, home of Ilio DiPaolo’s Italian Restaurant, whose parking lot still contained piles of evidence of the previous day’s itinerant snow band. With lake effect snow, it’s hit or miss. But when it hits, it hits. Fortunately, most of these plumes stay south of Buffalo (and then they can reach as far as Mendon). It’s only when the wander a bit north that things get dicey. When the wind speed and direction is just right, these narrow bands can rest along the extent of the Thruway from Buffalo to Rochester. When that happens I usually decide to reschedule any Buffalo meetings. (Yes, I did get stranded in Buffalo for three days once due to snow, but that was because of a nor’easter that slammed Rochester and, ironically, spared Buffalo). With this preamble, you might find greater appreciation for my thought process this Sunday. I knew the forecast. I knew the lake effect machine would be set on “maximum.” I also knew the forecast called for the wind speed and direction to align itself perfectly along the path of the Thruway just as we would normally be heading home after the game. Still, I decided it was worth the risk. Early in the morning, fully equipped in my winter gear, I headed towards New Era Field, expecting the light snow to fall soon after the game started, with heavier snow by game’s end. The fury of winter blasted through Orchard Park by the time I entered the stadium. For perspective on the magnitude of the event, consider this. It takes fifteen minutes to walk from my parking lot to the stadium. When I left the parking lot, there was barely a flake fluttering to the ground. Again, as with Ilio’s parking lot, the snow from the previous week’s battering had been piled high. In fact, it nearly blocked my trusted short-cut. When I encountered the mountain, I noticed those before me had created a series of steps ascending the hills. They were slippery (being snow and all), but I successfully surmounted it and headed for our seats. The winds began to blow just as I passed through the gate. By the time I sat down, visibility had been reduced to near zero. I couldn’t see the other side of the field or the scoreboards on either end. Prior to the start of the game, I sat motionless in my seat, trying to retain as much body heat as possible. The relentless snow covered not only my Pepsi bottle laying on the once bare tarp in front of me, but me and my coat, too. I swear I looked like Jack Nicholson in the final scene of The Shining. I stood for the National Anthem and decided to remain standing. It’s actually warmer to stand. In the meantime, by the middle of the first quarter, my Pepsi bottle was completely covered. By the middle of the second quarter, my toes and fingers were starting to get a little too cold. The wind was merciless. Also, by the middle of the second quarter, unbeknownst to me at the time, national audiences were being redirected from their local games to the Bills-Colts game. 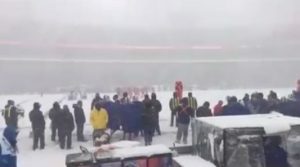 Everyone wanted to see the historic 2017 Buffalo Bills Snow Bowl. There has never been a game in Buffalo played in these conditions. And I was there. I knew this would be a story to tell the grandchildren. Again, if you grew up in the snow belts, you know about thundersnow. By the middle of the third quarter, the snow had drifted a bit north, but the wind persisted. I measured the snow on the tarp in front of me. It was about six inches. I dug out my Pepsi bottle and stood it upright, about two inches above the then current snowline. Then my toes started to get too cold. I decided to leave my seat, walk up the forty-some stairs, then pace the length of the covered concourse in hopes of warming them up. Trudging up the snow-covered steps proofed to be as rigorous as a Boy Scout hike. Thoughts of reaching the relatively calm enclosed concourse kept me going. When I reached the top, I ducked into the tunnel that led to the concourse. As I neared my destination, I discovered it has become a wind tunnel of blowing snow. I had forgotten that it was open at both ends. It represented no sanctuary, but a trap. I turned around and walked back to my seat. I walked the closed Abbott Road – the only plowed path – back to my car. Much to my surprise, my parking and car were cleared of snow (thanks to parking in a private lot), so I was able to quickly escape, dine and discuss, then travel the Thruway home without much trouble. This turns out to have been the right decision. Had I left Buffalo a half hour later, I would have been forced to drive home in a plume of lake effect snow along the entire stretch of the Thruway. Still, I love lake effect snow.